Autumn 2017 Mr. 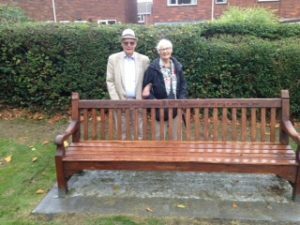 Rob Caddick was tending the garden at the home of Mr. Eric Prichard on the Walsall Road when he discovered an eight foot bench, on closer inspection he realised the bench had an inscription on it. “In memory of Thomas Garratt first chairman of this Fellowship and of Nellie his wife 1959″. Apparently this bench had been removed from the Senior Citizens Centre many years before as it was being vandalised. Rob reported his find to his mother, Cath, who mentioned it to the Local History Society. 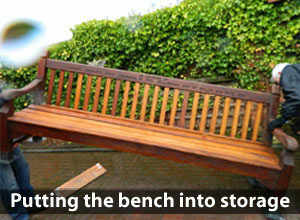 They took it upon themselves to get the bench restored. Two members of the District Council , (Cath Williams and Janet Johnson) donated towards the renovation and the Parish Council gave permission to situate the bench in the Memorial Garden, this will be done in the spring. 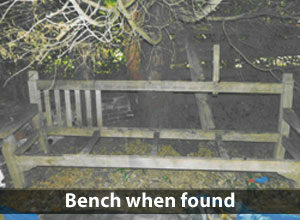 Mr. Owen Ingles offered to restore the bench, and a wonderful job he made of it. Jenni Bond (nee Homeshaw), who now lives in Tasmania, and her cousin Geoff Hackett contacted the society and reported that Thomas Garratt was their Grandfather. We would like to know what “the Fellowship” was. We assume it was held at the Co-operative Hall on the Walsall Road as the Senior Citizens centre did not open until February 1959, and Thomas died in 1951 and Nellie 1957.